Arlene Ruth Johnson, age 89, of Ames, passed away on November 22, 2018 at The Rose in Ames. Born on May 10, 1929 in Johnstown, New York, Arlene was the daughter of William and Grace (Bentley) Husted. She graduated from Johnstown High School in Johnstown, NY. Arlene was united in marriage to Donald Johnson on July 10, 1947. The majority of her life was spent at home raising her children and being a caregiver. Arlene moved to Ames, Iowa, where she resided for the past nine years. She was a member of the Leonardsville United Methodist Church in Leonardsville, NY. While in Ames, Arlene attended Christ Community Church. In her spare time, Arlene was an avid reader. Her family and friends were always the number one priority in her life. Arlene is survived by her daughters: Donna (Craig) Gallt of Ames, Linda (Joseph) Wehrle of St. Mary’s, KS, and Sherri (Jeff) Garstka of New Hartford, NY; her son, John Johnson of New Port, NY; 9 grandchildren; 36 great-grandchildren; 5 great-great-grandchildren; and numerous nieces and nephews. She was preceded in death by her parents; her husband, Donald; and a brother, Bill Husted. A memorial and committal service will be held at a later date at The Rose in Upstate New York. Burial will be in Ephratah Cemetery in Ephratah, NY. Funeral arrangements are under the direction of the Adams Funeral Home and online condolences may be left for Arlene’s family at www.adamssoderstrum.com. 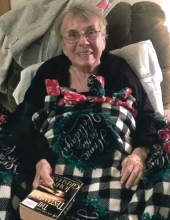 In lieu of flowers, memorial contributions in Arlene’s name may be directed to the Ames Public Library, 515 Douglas Ave., Ames, Iowa 50010 or the Ames Animal Shelter, 325 Billy Sunday Road, Ames, Iowa 50010. To send flowers or a remembrance gift to the family of Arlene Ruth Johnson, please visit our Tribute Store. "Email Address" would like to share the life celebration of Arlene Ruth Johnson. Click on the "link" to go to share a favorite memory or leave a condolence message for the family.